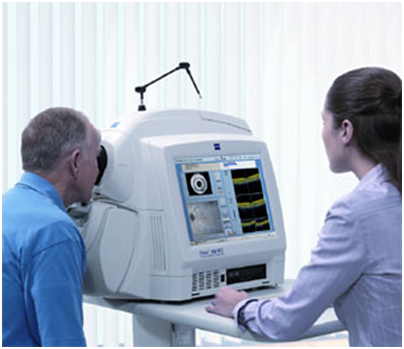 Ocular Coherence Tomography (OCT) is an exciting new technology that allows us to look deep into your eyes. The OCT is a fantastic piece of equipment that allows our Optometrists to diagnose conditions such as macular degeneration, glaucoma, posterior vitreous detachments and retinal tears whilst they are in their early stages. In many cases, early detection and management can save vision that may have otherwise been lost. How does the OCT work? What conditions can be detected with the OCT? What is involved in an OCT examination? Why Should I Ask for an OCT Scan? By having a comprehensive eye examination and requesting an OCT examination at the time of your consultation, can help ensure that your eyes remain healthy and that any problems with your eyes are detected in a timely manner. To inquire about the OCT scan or to book an appointment with Cooper and Lourie Family Optometrists you can call us at our Nedlands practice on (08) 93868581 or our Innaloo practice on (08) 94461887. We look forward to helping you with your eyes.